A brand new photo gallery is a great way to show your love and passion to your couples and very close friends especially on St. Valentine’s Day. It is a great way to make a proposal. Also it can be used to show your love story or wedding images to your friends in a new and contemporary way. This project includes 30 sketched elements and 10 Light Leaks footages and 7 individual and global color presets and original parallax animation. New project for After Effects “Slides” It is very well suited for presentations, family, wedding videos. All very easy to set up, you do not need a separate plug-ins. Included full video-manual, that even the beginner will easy understand how to tune a this project. Ink Slideshow is a simple but very stylish and inspirational cinematic after effects project. It can be used for any occasion. Perfect for promotions of fashion events, dance party, reels , opener, musical events, slideshow, music video or photos gallery, trailer, promo, trailer etc. It is very easy to customize. Just edit text layers and put your images or video into Media Placeholders. New project for After Effects “Caustic” It is very well suited for presentations, awards, wedding videos. All very easy to set up, you do not need a separate plug-ins. Included full video-manual, that even the beginner will easy understand how to tune a this project. The Wedding Album After Effects template is a beautiful slideshow for wedding or love themed projects. This template has two versions: color images and black & white images. It also includes 12 media holders and 12 editable text holders. Just add your media, change the text, and hit render. Create your next beautiful wedding slideshow using this great AE template. New project for After Effects “Coloroid” It is very well suited for presentations, family, wedding videos. All very easy to set up, you do not need a separate plug-ins. Included full video-manual, that even the beginner will easy understand how to tune a this project. Let me introduce a new professional template of presentation / promo / trailer / title sequence animation with perfect and advanced parallax effects and cool drop ink VFX to make your media and message stand out. This template well structured and organized with attention to details! Perfect to romantic presenation, epic slideshow, action or war themes may be romantic opener or wedding slideshow. Just do it! Hello! Let me introduce you professional presentation / promo / trailer / title sequence animation with advanced parallax and double exposure effects to make your media and message stand out. High quality template well structured with attention to details! Perfect to romantic presenation, epic slideshow, action or war themes, wedding titles or wedding slideshow. Also you can use that template to create fashion porfolio or valentine presentation. Romantic vintage AE template, that helps you to create beautiful wedding aftermovie, lovestory film, birthday greeting or any other retro slideshow. And with its modular structure and detailed videotutorial you can do this with ease. Project works with After Effects CS5 or higher and doesn’t require any plug-ins. 3 versions included – Short (0:34), Normal (1:44), Long (2:21). New project for After Effects “Night Lights” It is very well suited for presentations, awards, wedding videos. All very easy to set up, you do not need a separate plug-ins. Included full video-manual, that even the beginner will easy understand how to tune a this project. 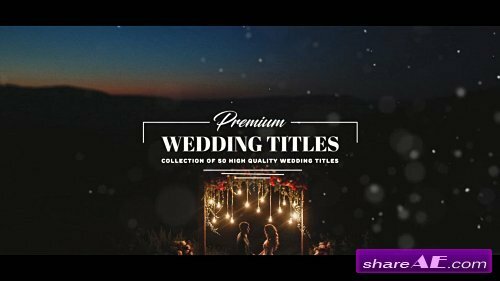 This After Effects template features 50 wedding titles with particle and light effects that give them a unique look. It's perfect for adding titles to your wedding or engagement videos, slideshows or any other elegant video project. This project also requires Trapcode Particular to work properly. Just edit the text, make the adjustments needed and render. Cheers!